The Ukrainian landscape recreated in oil paint, and the bald eagle, a symbol of the United States, brought to life in strokes of pencil. 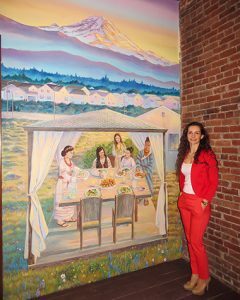 These are the visions of Olha, a Ukrainian refugee who was resettled by Jewish Family Service. Both pieces were on display at ARTvocacy in 2017. ARTvocacy, which takes place on World Refugee Day in 2018, brings together refugees and those who support them. The event is coordinated by JFS, the International Rescue Committee and Lutheran Community Services Northwest. The event is more than a chance to show community support for refugees though. It is also time for refugees to meet others with similar experiences and build new connections. After ARTvocacy last year, Project Feast commissioned Olha to draw illustrations for the zine “Roots & Recipes” and paint a mural about friendship and traditional food at Ubuntu Street Café. Ohla will again exhibit at ARTvocacy. “I will be showing new artwork,” she said. Her art will feature parts of her new life in the Puget Sound region, including an eagle flying over Mount Rainier and a view of Seattle from a ferry ride she took with her family. For more of Ohla’s work and art by refugee artists, join us in celebration of World Refugee Day.